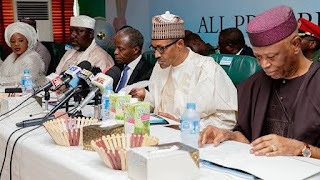 The All Progressives Congress, APC, has told a Federal High Court sitting in Abuja that President Muhammadu Buhari lacks the power to determine tenure of its officers. The Independent National Electoral Commission, INEC, the APC, the party’s national chairman, Oyegun and the National Organising Secretary, Senator Osita Izunaso were joined as respondents in the suit. At the resumed hearing on Wednesday, counsel to the agitating members, Jibrin Okutepa, SAN, demanded that the case be heard since Buhari had at the National Executive Council (NEC) of the party on Tuesday, admitted that the tenure elongation was illegal. However, defence lawyers, Akin Olujimi, SAN, Joseph Daudu, SAN, James Onoja SAN, and Idris Yakubu, asked the court to adjourn the matter to enable them respond to the originating processes just served on them. Having listened to the argument of counsel, Justice Nnamdi Dimgba assured that the court would give fair hearing to all parties in the matter. He also ordered the filing and service of processes before the court and adjourned till April 16 for hearing.